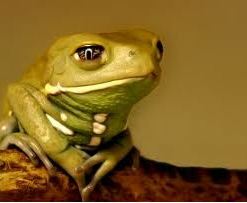 Our coolest new animal is the Waxy Monkey Tree Frog! These tree frogs are adorable with tons of personality. Unique among amphibians, these little guys actually come from the drier part of the jungle and love to sit up in the trees, right under the sun. They secrete a waxy substance to stop from drying out (hence the “waxy” part of their name.) They have some of the most expressive eyes you’ll ever see on a tree frog. Check them out, they’re quickly becoming a staff favorite!